Black Isle native Karen presents her printed scarves and jewelery through such garnered, timelessly classic institutions as Liberty, London. A graduate of Edinburgh College of Art and London's Royal College of Art, she went on to work with Margaret Howell and set-designer Fred Butler before launching her eponymous label. Poppy and Luis are the incredible team behind Edinburgh Casting Studio, Scotland's first ever Body Casting Studio. Both from Norfolk, they began work casting taxidermy jewellery by the name Runaway Fox, which developed over time the more adventurous they became with sculpting and the more skilled they became at casting. Today, they are dedicated to creating bespoke sculptures of babies, children, adults and pets in a friendly and non-judgemental environment. Dundonian designer based in Edinburgh, with a passion for engaging and effective communication. Clients include: V&A Museum of Design Dundee, Creative Scotland, Edinburgh Art Festival, Edinburgh International Film Festival, Scottish Album of the Year Award, Scottish Music Industry Association and Edinburgh's Hogmanay. Dr Stacey Hunter is an architectural researcher at the University of Edinburgh, her independent work as a curator connects design thinking and practice to the everyday life of cities. As co-editor of The New Metropolitan, a web-magazine about new cultures of urban citizenship Stacey works with a network of researchers from Sarajevo to Lisbon commissioning content and overseeing design and social media. Janine Matheson is the Executive Director of Creative Edinburgh. With over 10 years experience working in, and supporting those within the creative and cultural industries. Janine is also a freelance creative producer, visual artist and founder of Sierra Metro. Janine is part of the Desire Lines group and a British Council Pontignano Fellow. Mr Buckley Interiors & Stuff is a studio focusing on creating brand experiences through Interior Design, Print, Web & Strategy. Sam Buckley has worked with clients from small independent fashion retailers to bar & restaurant owners to established brands and also individual clients to fulfil lots of different jobs from small but detailed print projects to rebrands and retail interiors. Workhorse Press is an independent printing and publishing studio based in Edinburgh. Founded in 2010, they provide a printing service using a Risograph duplicator. Dominic and Orlando also use the studio space for their own practices, which you can check out here dominickesterton.com and here orlandolloyd.co.uk. Zuzanna is an Edinburgh based illustrator and designer. She studied illustration at Edinburgh College of Art and graduated in 2011. She illustrates by day and draws comics by night. She also creates fine art prints, using traditional printmaking techniques: screenprints, woodcuts and etchings. BertyB is a Scottish design company that creates bold, unique printed textiles that celebrate the perfect imperfection of the makers mark. A pattern maker at heart with a natural mid century aesthetic, BertyB is particularly influenced by the post second world war textile movement and Scandinavian design. BertyB lovingly creates accessories and homeware products to showcase her patterns and strives to design energetic, colourful textiles that are a mixture of classic and contemporary design. She is passionate about working with UK suppliers and designs and manufactures many of her products in-house. Jackie Oudney is a film and commercials director. She was born and raised in Dundee and moved to London to study theatre at the Royal Academy of Dramatic Art. Her two short films, STATION and VAGABOND SHOES have won a clutch of awards including the Kodak / BAFTA Short Film Showcase and two BAFTA nominations. In 2009, she completed her first feature, a very British romantic comedy called, FRENCH FILM, starring Hugh Bonneville, Eric Cantona and Anne-Marie Duff. This picked up two major awards at the Monte-Carlo Film Festival for Best Actor and Best Screenplay. Jackie has won many prestigious, international awards for her commercial work including a Silver Lion at Cannes, a silver D&AD pencil, several BTAA arrows and a gold Promax Europe award. Designer and publisher Colin Taylor is a graduate of Central Saint Martins. Colin led the MA interactive design course at Central Saint Martins and has also taught at the Royal College of Art and CalArts. Stance Agency help clients tell stories about their brands that talk to their audience in a captivating and targeted way. We do this with emotive content delivered in thoughtful design and built on clever technology. Every idea, design or story is researched, planned and measured with clients, ensuring they match business needs, get to the right people and create growth. 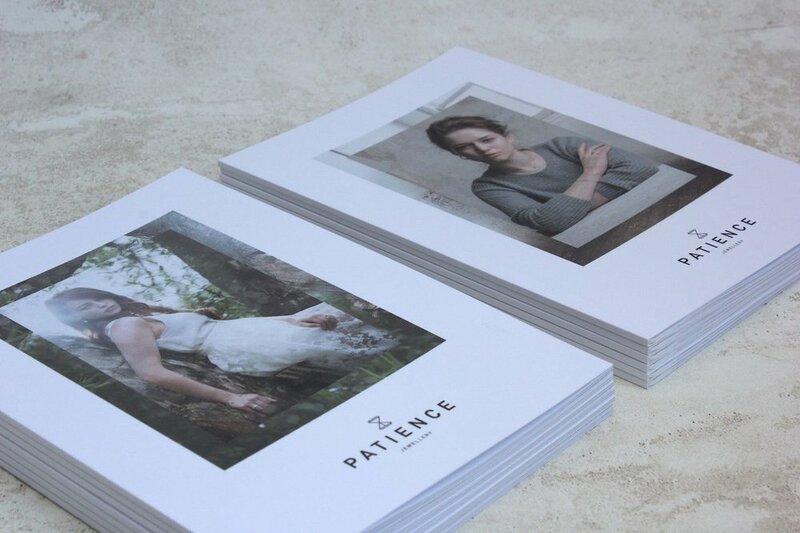 Patience Jewellery is an Edinburgh-based luxury jewellery brand. Striving to create timeless, quality jewellery that's free from the constraints of design trends, their unique collections are carefully designed and meticulously crafted to be worn everyday, loved for generations and treasured forever. Patience Jewellery also offers a bespoke service which allows you the chance to work closely with award-winning designers to bring your ideas to life. Patience Bespoke has no limits so this is your chance to let your ideas loose – choose your materials, your favourite gemstones, add personal touches and see your dream piece of jewellery become a breathtaking reality. Genevieve Ryan is a Senior Designer with a wide range of experience across all aspects of digital and printed design. She graduated from the school of design at Edinburgh College of Art with a BA Hons in Visual Communication in 2009. Since then, Genevieve has worked in-house with marketing and IT companies, freelanced through design agencies and consulted directly with a variety of clients. This has given her a wide range of experience across each aspect of the design process, including user research; information mapping; strategy; visual research; creating concepts; communicating logic behind ideas; developing ideas methodically through design phases; presenting design philosophies to team members and clients; reworking designs to fit revised requirements; and delivering high standards of work to tight deadlines. Based in Studio 3, Laura is a multi-disciplinary photographer, with a mission of producing work that pursues the delight in beauty and quiet reverence amidst the moving world. With a passion for film photography and unscripted journeys, the comeliness, mystery and romance within life and nature inspire visual excellence. Independent Animation, Motion Graphics, and Illustration artist. Holly-May uses a combination of traditional and digital techniques to create tailored animated films for a variety of purposes, including; film, music videos, mobile games and advertising. Chloe Patience is a fashion & textiles designer, hand embroiderer, illustrator and co-founder of international brand Bebaroque. Current projects include the Missing Chairs collection by Nobody and Co, in collaboration with Timorous Beasties. Chloe also hosts various embroidery workshops, see her Facebook Page for details. A creative agency where ideas come first. We are Jane Strachan and Paul Mason. A couple of PUNKs with a dog and over 35 years experience creating award-winning campaigns in some of the UK's top agencies.